When you have teeth missing, it affects much more than just your smile. It can affect your self-esteem. When people have missing teeth they try not to smile or they cover their mouth while smiling. Weston Park Dental has a solution. Not so long ago the only solutions available for people with missing teeth were bridges and dentures. Thankfully today there are more options available. Tooth implants can give people a longer-term solution that is easy and comfortable. Dental implants are the modern way to replace missing teeth and offer a permanent solution for your missing teeth. 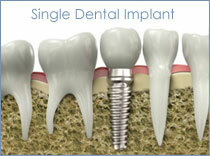 A person who is missing any number of teeth may find that dental implants are the perfect solution. Inserting Dental Implants is a fantastic option for people who are generally in good shape orally but have maybe lost one or two teeth. Dental Implants in every way feel, function, and look just like natural teeth. They can give people the confidence to once again enjoy eating, laughing, speaking, and smiling. No more worrying about having dentures. These implants also help to preserve the facial structure by avoiding the jaw bone deterioration that missing teeth can cause.